"It was 102 degrees yesterday, the air conditioning was cranked, and I got too much sun at the pool. Christmas is pretty much the last thing that should be on my mind, right? Except that somehow, December 25 always manages to sneak up on me. And with the inevitable gift buying/making rush, Christmas decor projects tend to take a back seat. So really, why not make a Christmas tree skirt on a 102-degree day in July? "With that in mind, welcome to my stop on the Christmas in July Blog Hop, hosted by Elizabeth of Don't Call Me Betsy! Every year since I started sewing, I've been saying I would make a Christmas tree skirt for my family, and this year, we will finally have one. A few months ago, I pinned this half-square-rectangle tutorial from the Modern Quilt Guild's "100 Days of Modern Quilting" series. 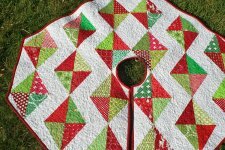 When I went to design this tree skirt, it called out to me. 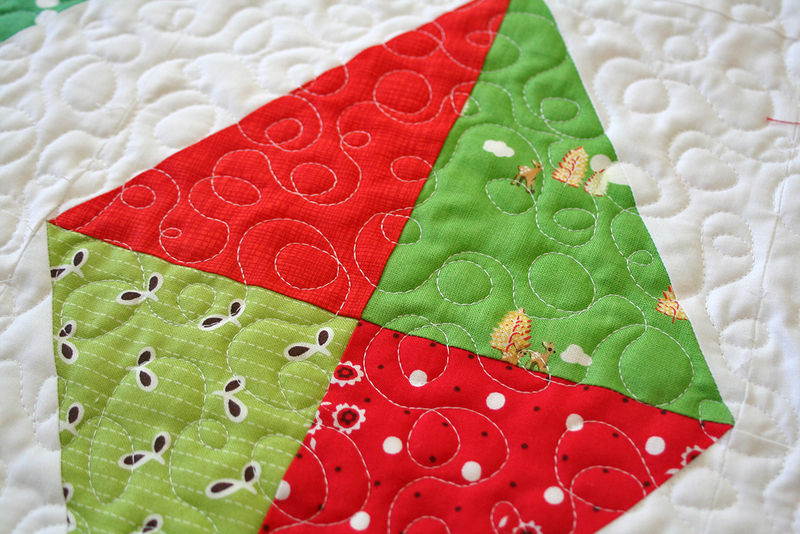 Here's how to make the tree skirt, using the MQG's tutorial."